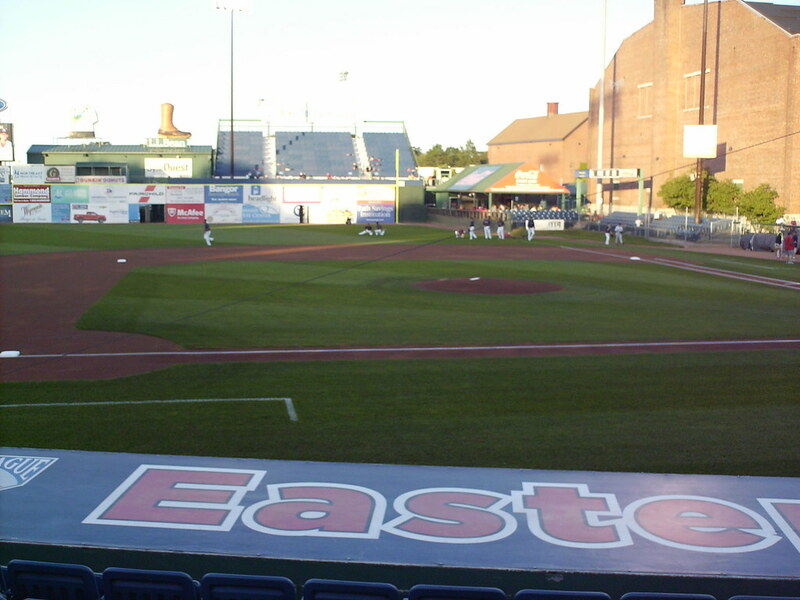 The view from behind home plate at Hadlock Field. 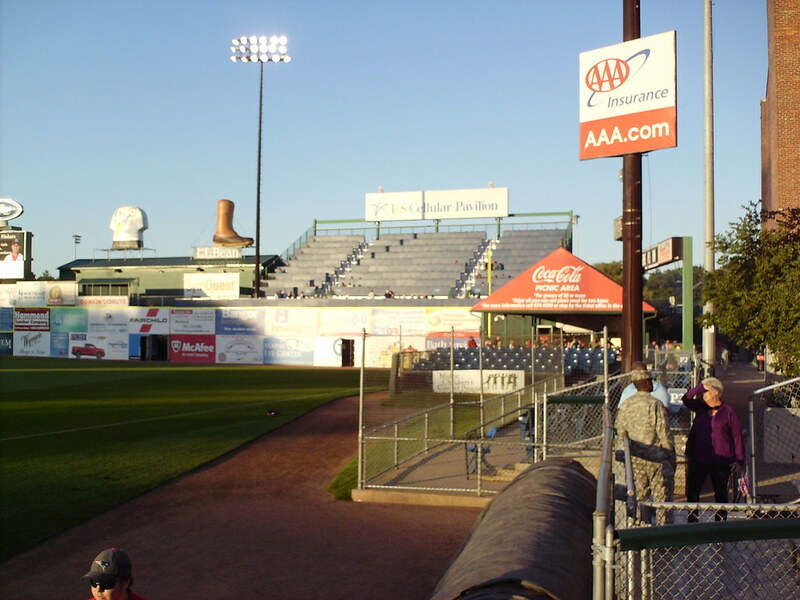 The grandstand at Hadlock Field, as seen from the right field corner. 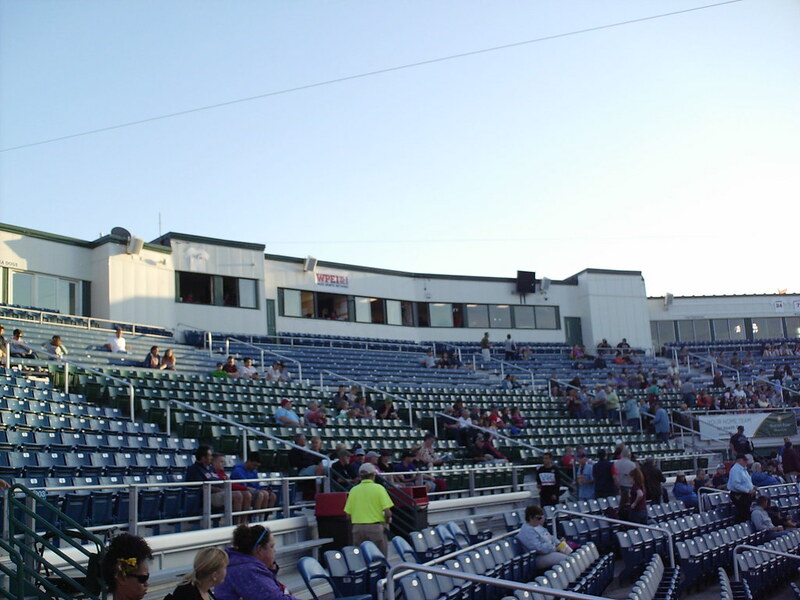 The pressbox and luxury suites, at the top of the seating bowl. 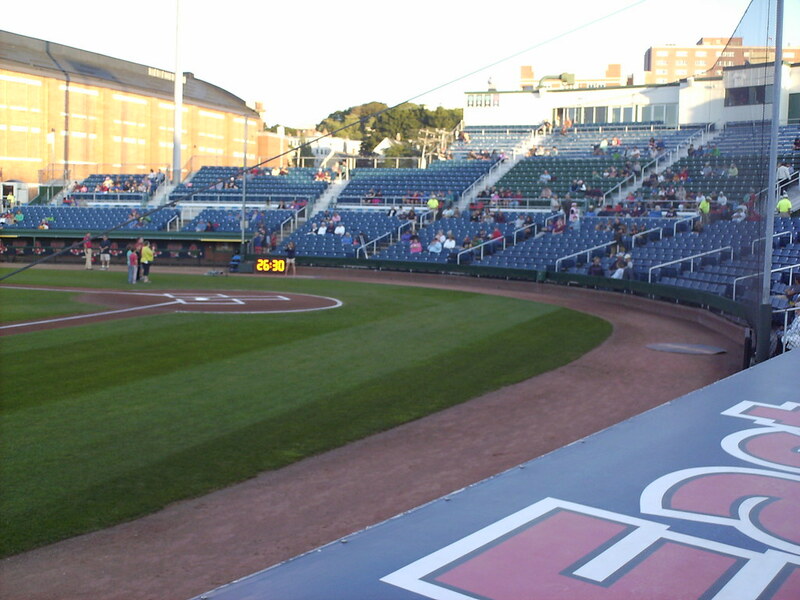 The luxury boxes are all named for former Boston Red Sox legends, and jerseys on the stadium facade celebrate former Sea Dogs currently playing for the Red Sox. 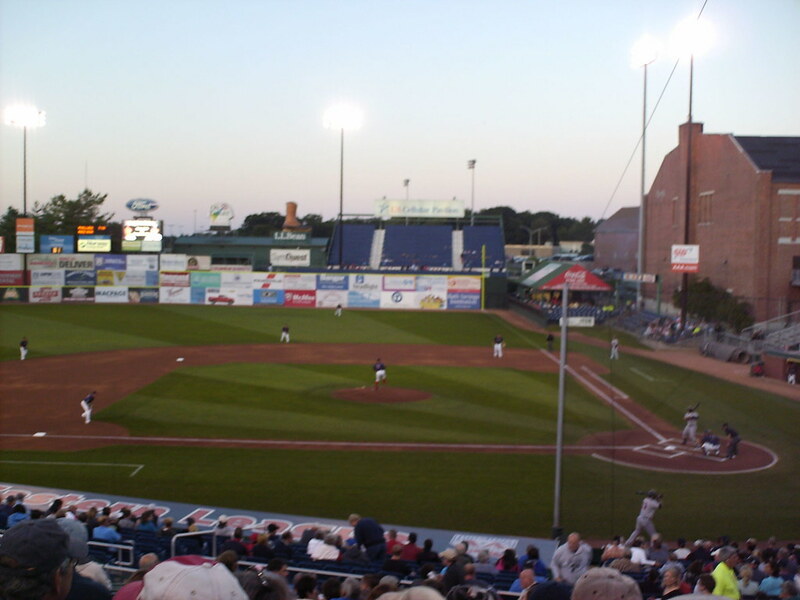 Sea Dogs championship banners hang on the first base side at Hadlock Field. 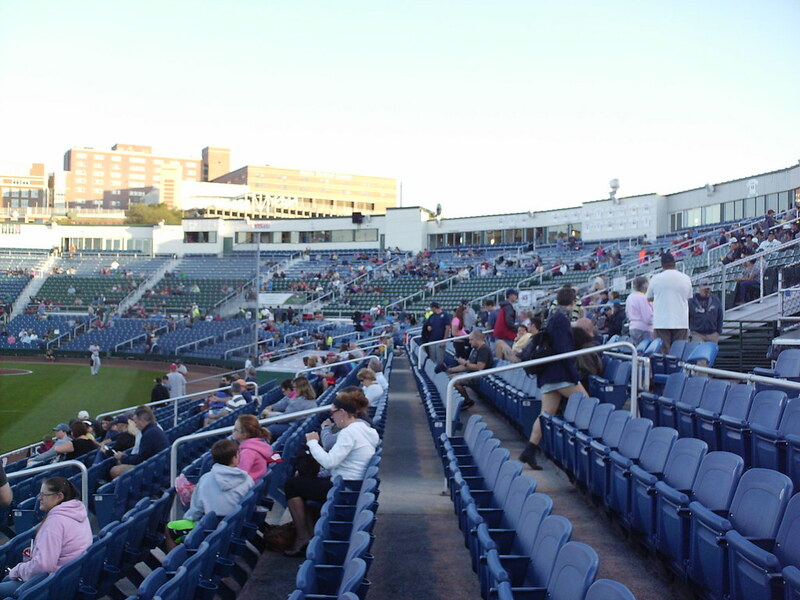 The seating bowl features three separate color coded seating areas, with aluminum bleachers making up the upper blue general admission area. 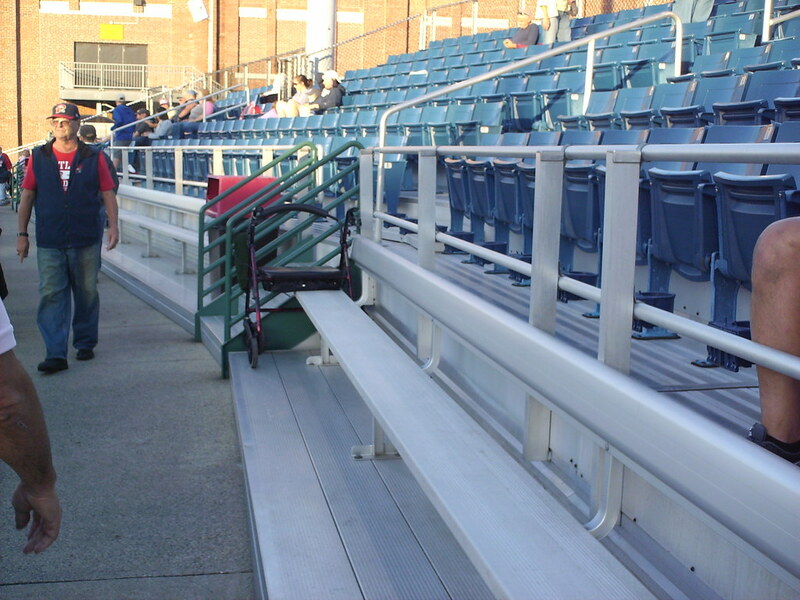 A single row of metal bench seating runs along the back of the grandstand walkway. 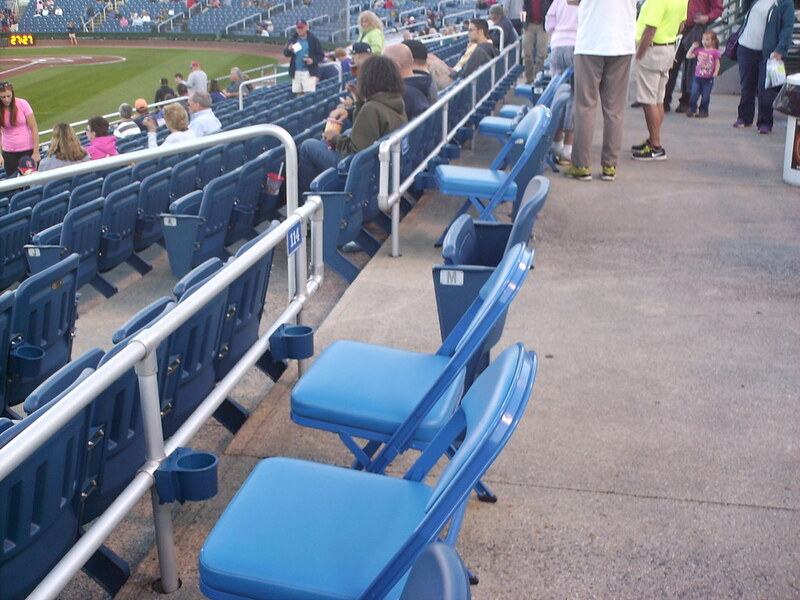 Removable folding chairs add extra seating to unused handicap seating boxes. 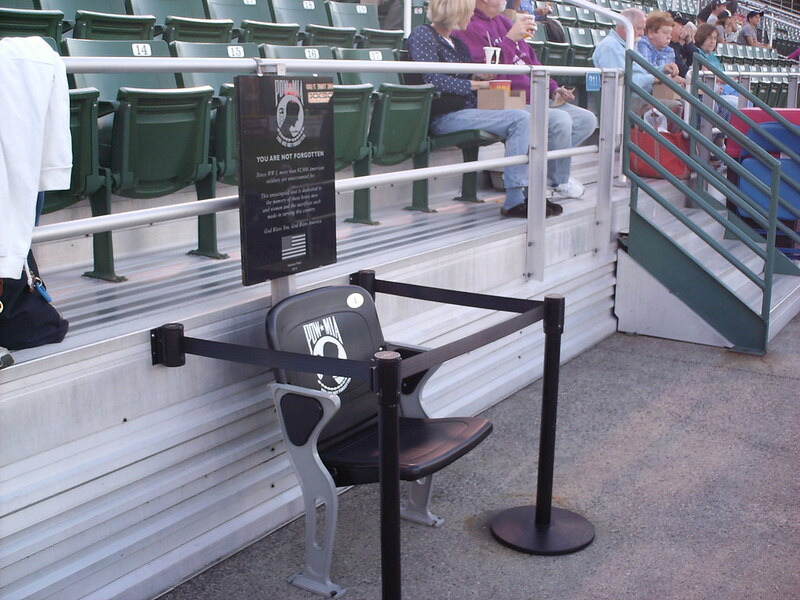 A single reserved POW/MIA seat sits, roped off, along the grandstand walkway. 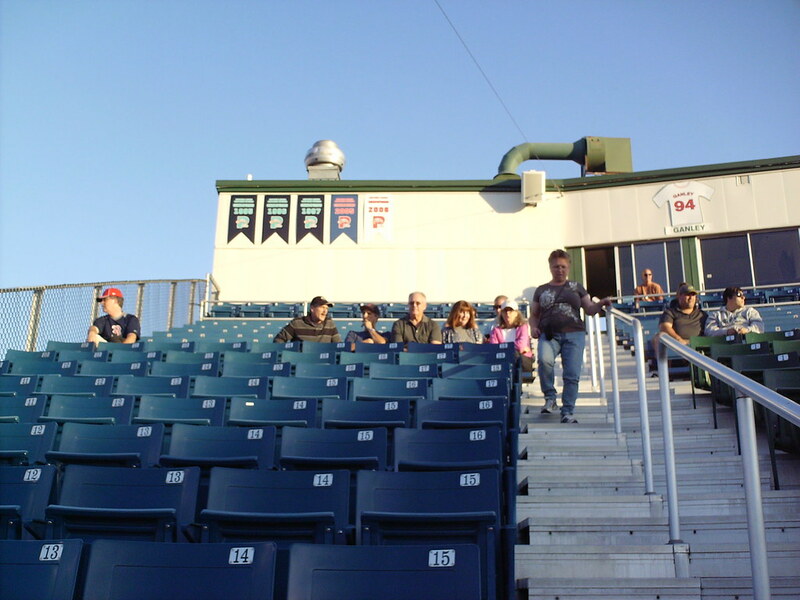 A large elevated bleacher section sits in the left field corner of the ballpark. 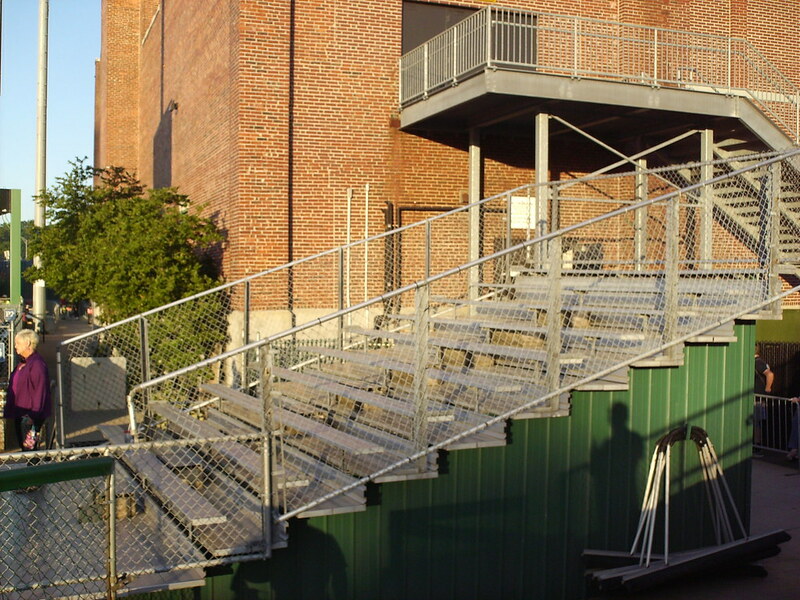 A very small section of bleachers sits down the first base line. 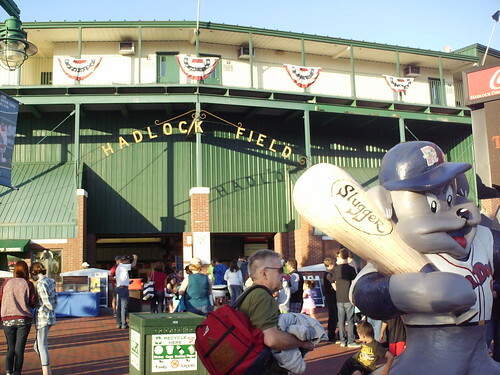 The Portland Pavilion, home of minor league basketball in Portland, juts into the right field corner of the park and is an inviting target for foul balls. 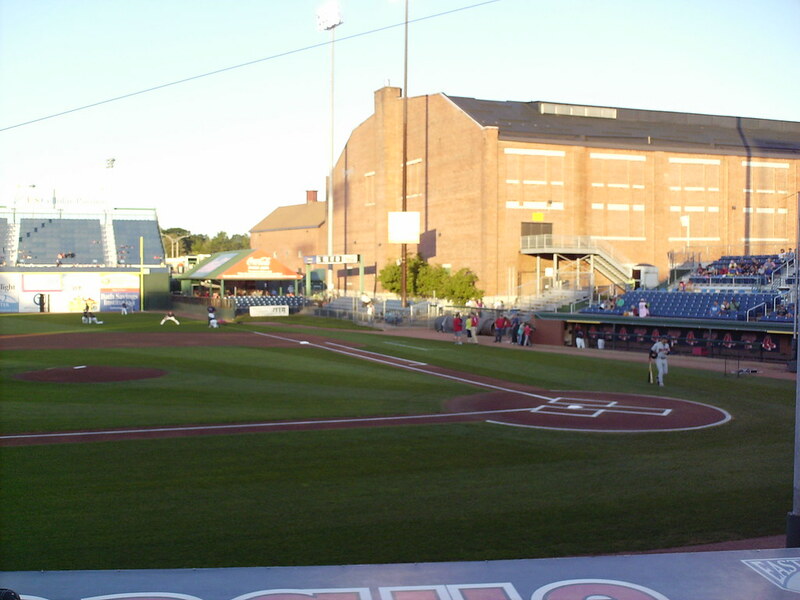 A small party section in front of the building features a section of stadium seating, and a small grassy hill sits in foul territory. 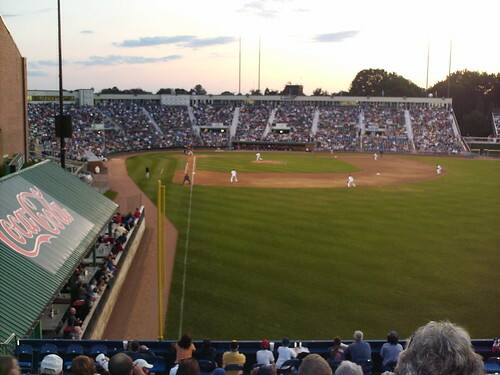 The Pavilion seating area, atop the right field fence, features drink rail seating and is meant to mimic the Green Monster seating at Fenway Park. 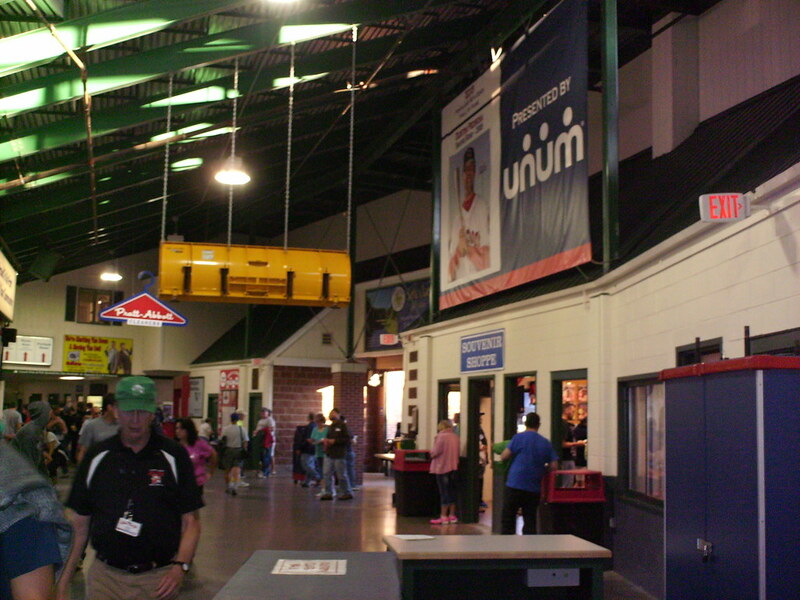 The main concourse, underneath the grandstand, at Hadlock Field. 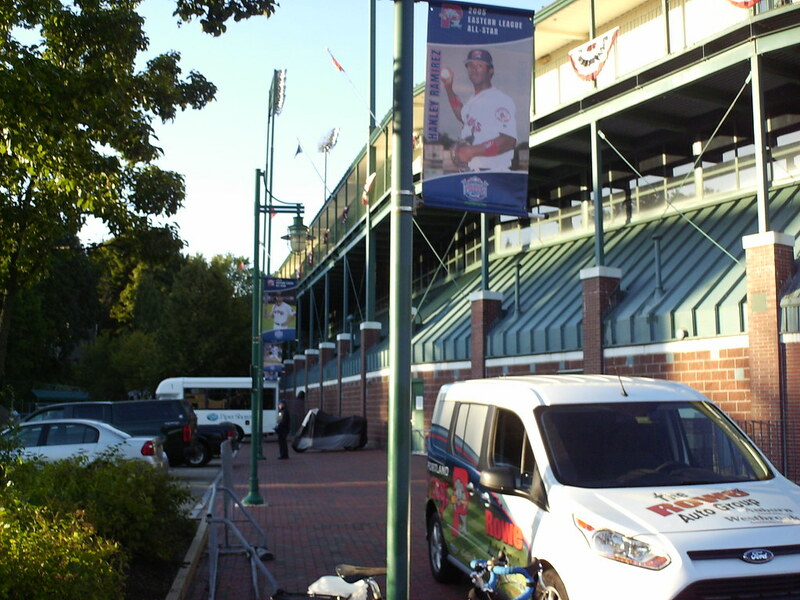 Banners outside the park celebrate former Sea Dogs, and upper deck luxury suites open to a catwalk outside the stadium. 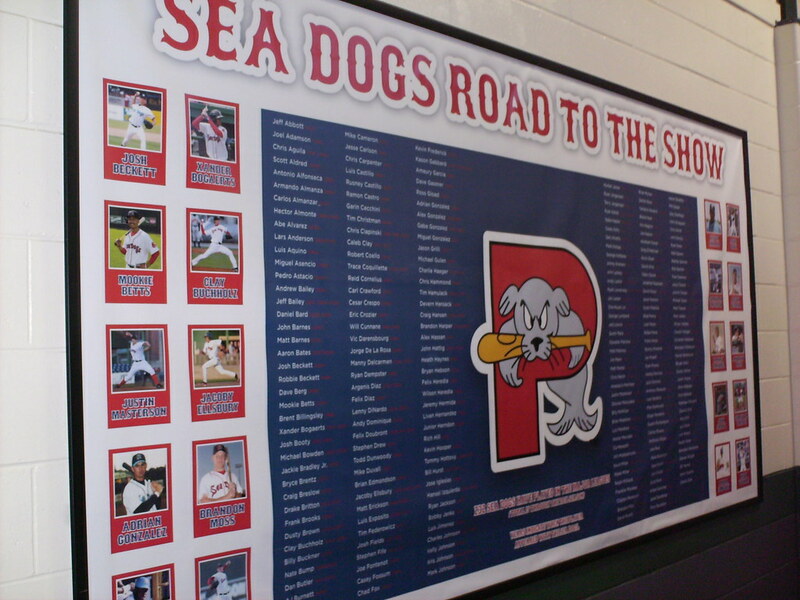 A banner along the concourse honors all former Sea Dogs players who have made it to the major leagues. 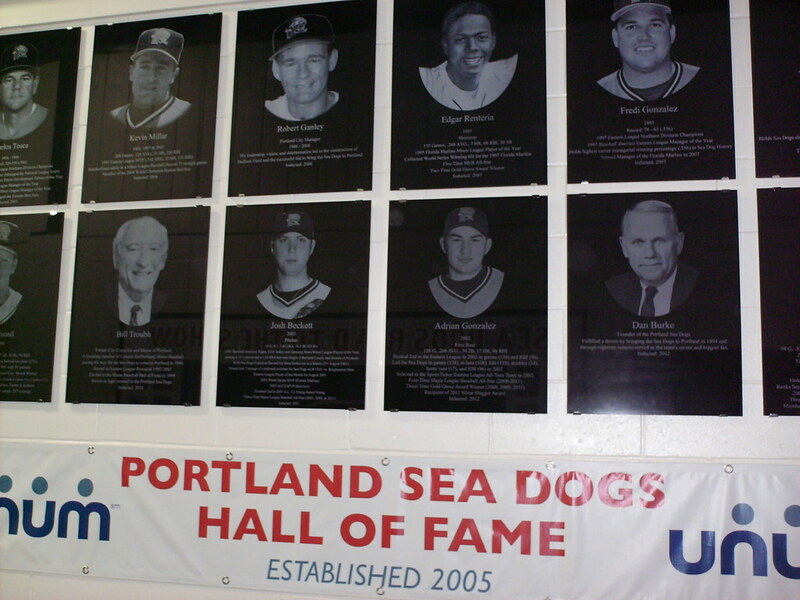 The Portland Sea Dogs Hall of Fame exhibit at Hadlock Field. 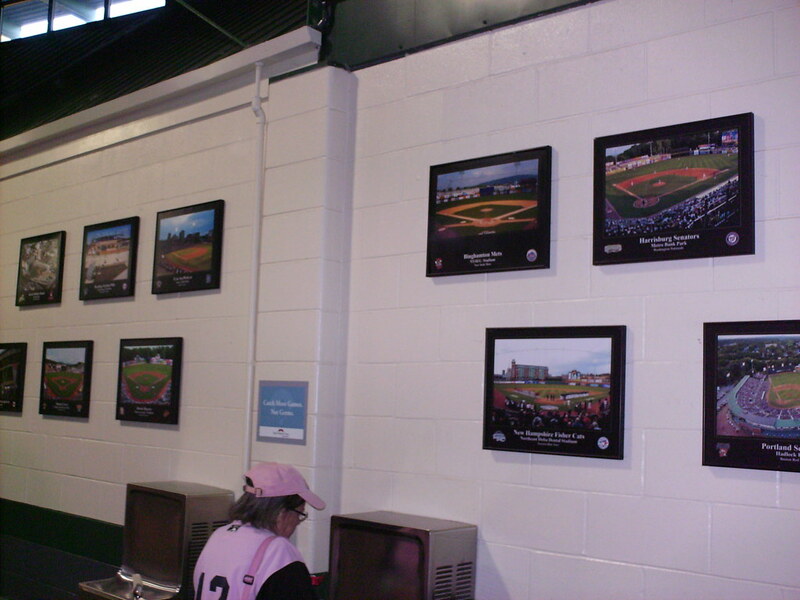 Photos along the concourse highlight all of the other ballparks in the Eastern League. 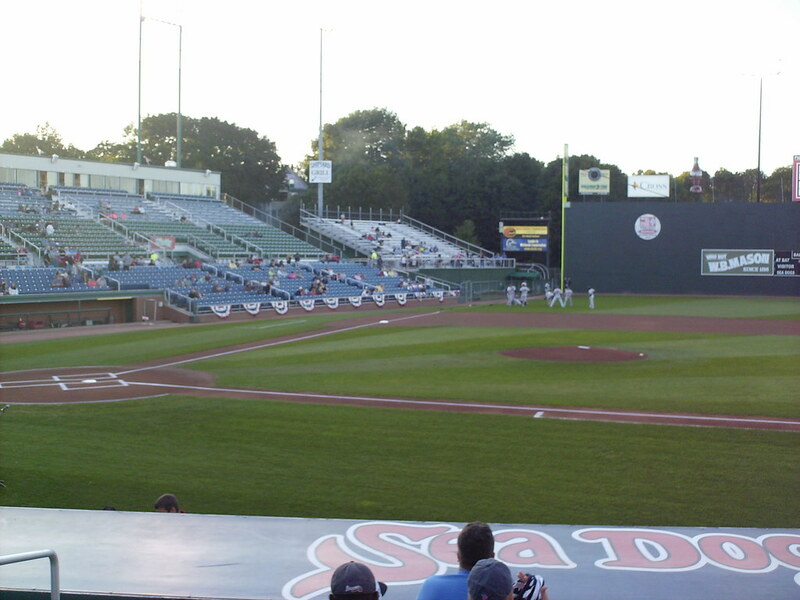 The park features a very short backstop, and the grandstand tapers off as it moves toward the Pavilion building. 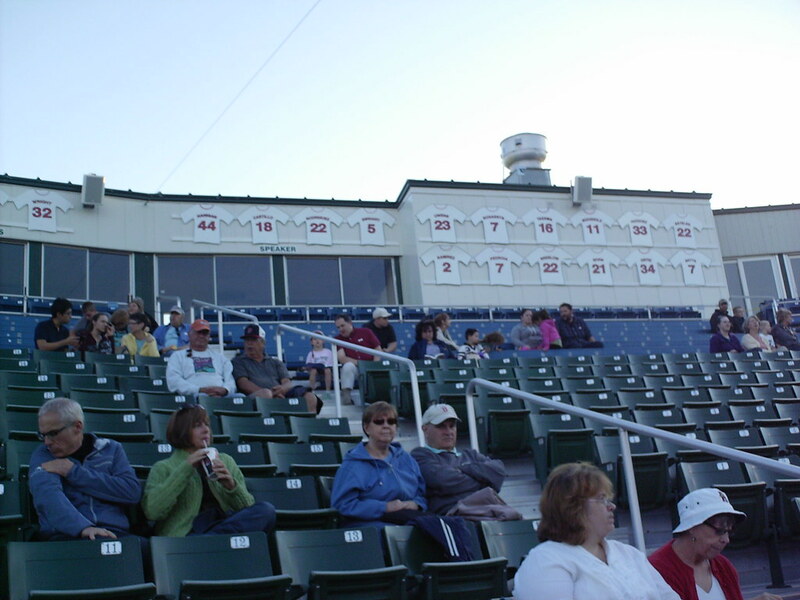 The visitor's bullpen, in front of the bleachers in the left field corner. 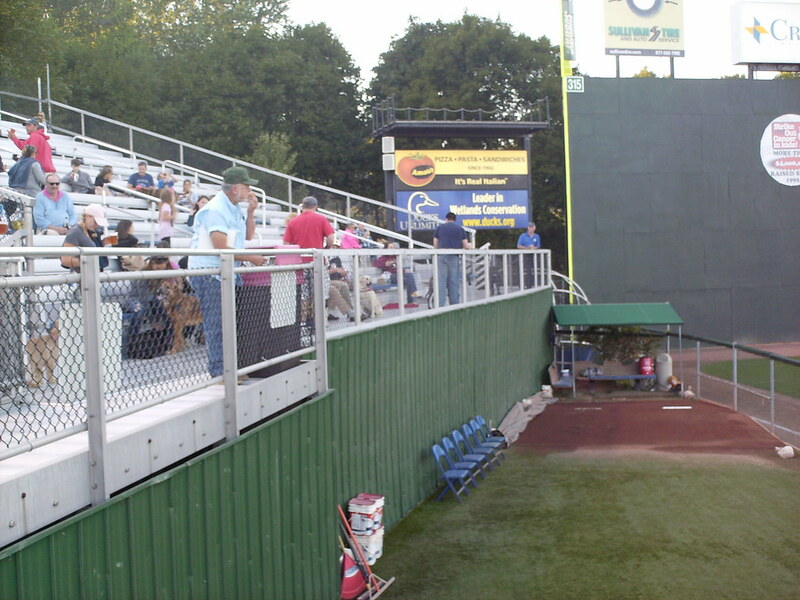 The home bullpen sits atop the right field fence. 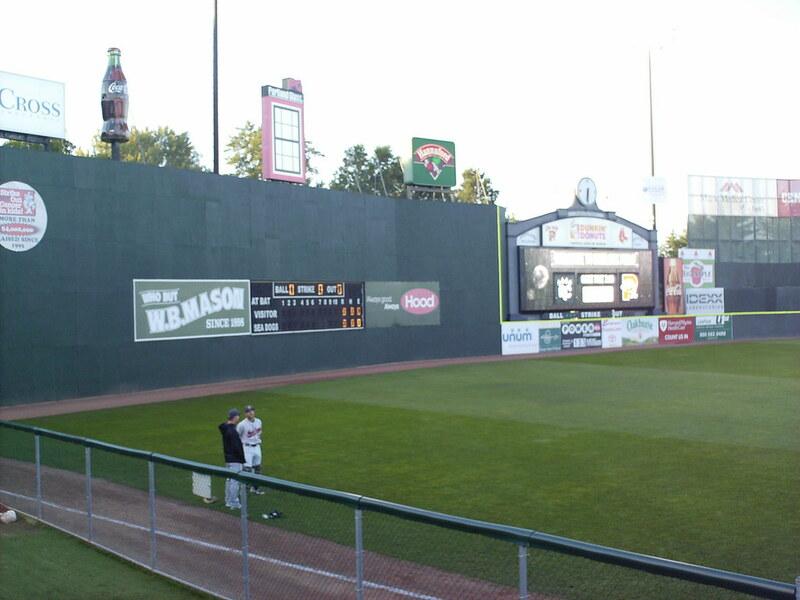 The wall's height drops after the bullpen, leading to a shorter fence in center field. 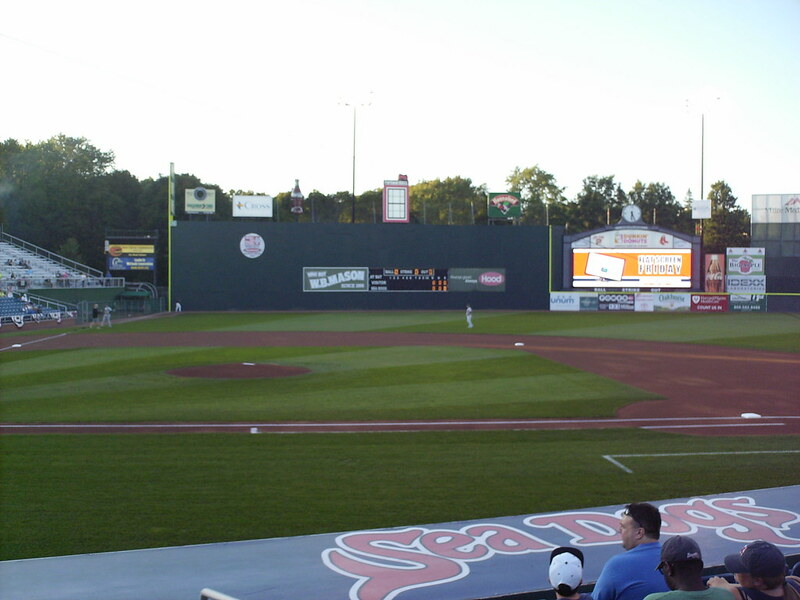 The Maine Monster, Portland's version of Fenway Park's Green Monster, towers over left field. 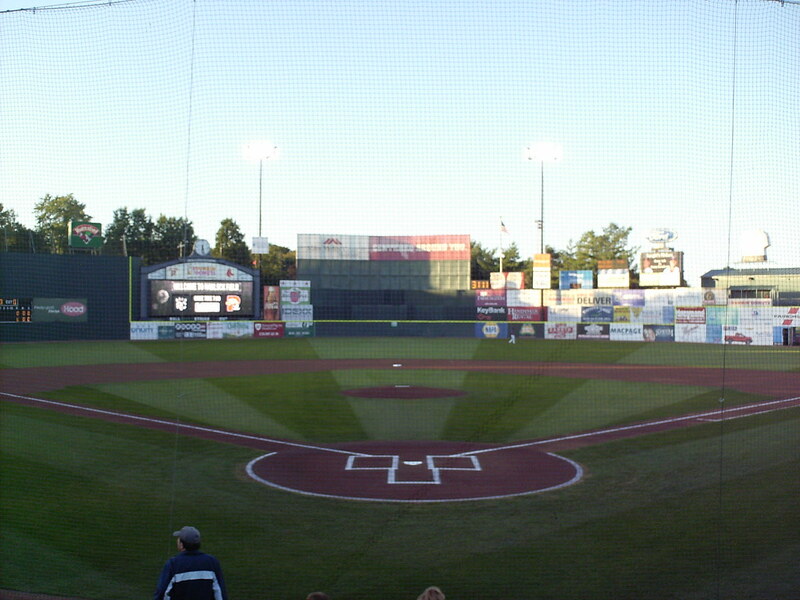 Hadlock Field's version is taller than the one in Boston and features a digital linescore board. 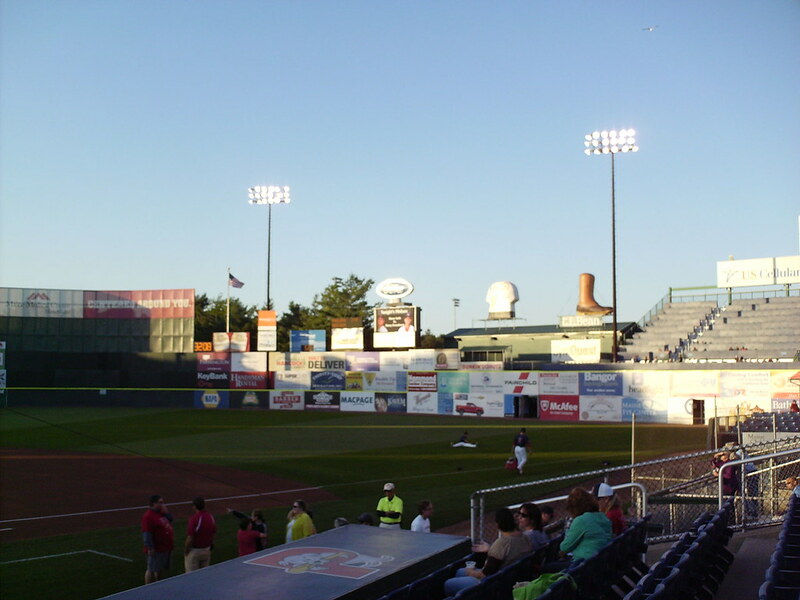 The scoreboard and batter's eye in center field at Hadlock Field. 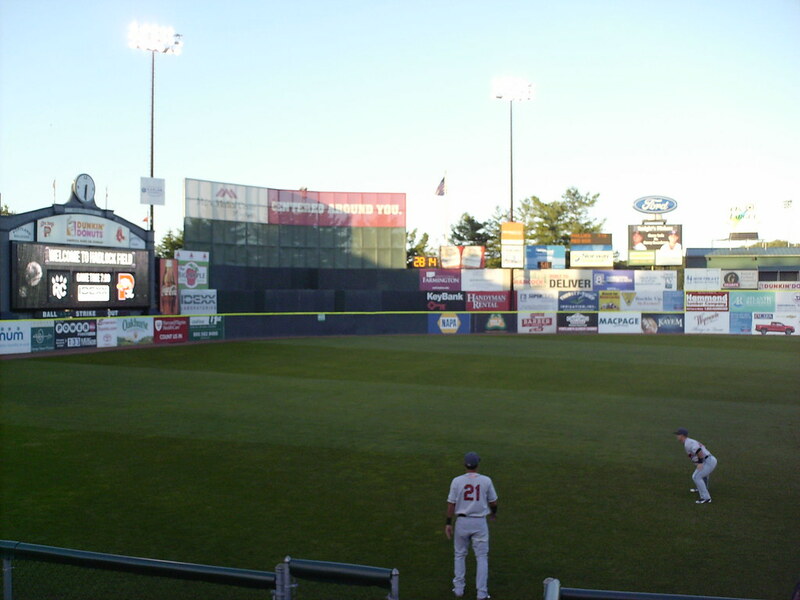 The Portland Sea Dogs on the field during a game at Hadlock Field.